Just a storm window between two chairs (I don't have a glass table) and some parchment paper, then the pasta. 2 lights underneath. Sorry I missed this the first time through. 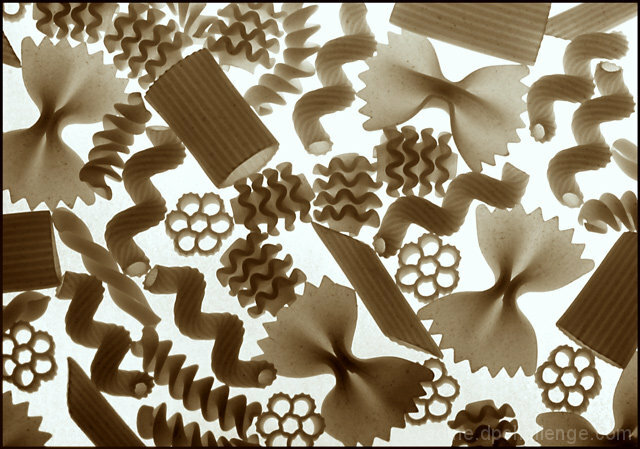 The back lighting, the textures, the shapes of the pasta and the original idea all work great. the backlighting works great. nice idea, very creative .. I like the way the different pasta thicknesses create a nice range of tones. I don't particularly like the color; it seems a bit bland for the subject. Perhaps a bit more saturation would help. Fine job here! Pasta is a great subject. Very nice! Looks like something i've done before. Great shapes! I love noodles, was this shot taken from below? Very nice abstract ... love the way you've displayed different shapes and sizes ... nice lighting, too. Lovely shapes. Great backlighting, you managed to keep the highlights nicely and show the texture in the same time. Very well done. While there are many subjects in this photo I think you have done a great job not to make a mess of it but to arrange it in an appealing way (if this makes any sense). Very clever and the lighting here works really well. This is a fantastic idea! The backlighting is very well done. Congrats! Proudly hosted by Sargasso Networks. Current Server Time: 04/23/2019 03:54:10 PM EDT.